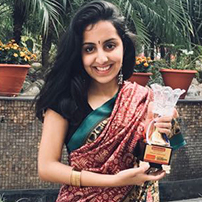 Vidushi Sabharwal is currently mentoring over 150 young girls and a team of 8 fellows at a government school as a Teach for India fellow and Math Content Advisor. She is also the co-founder of Bass Ek Raah, a charitable society guiding people through counselling and consultancy. A twenty two year old Economics Graduate from Delhi University with a touch of books, art and people, research is her felicity. During her graduation, she interned with Centre for Civil Society on ‘Refining monitoring mechanisms through SMCs in government schools’; Central Square Foundation for localizing math content online in partnership with Khan Academy; and college researches in ‘Role of behavioral economics in effective subsidy policymaking’ and ‘Economics and erosion of property rights in India’. This ‘Young Entrepreneur 2017’ and ‘Innovator in education 2018’ awardee wants to pursue Master of Public Policy and make Indian education a ‘growing by learning’ space.